Recognized post graduate Degree/Diploma from a recognized university and registered with Delhi Medical Council. The candidate must not have completed 03 years Senior Residency in any hospital in India. In case where no fresh candidates are available, candidates who have completed 3 years of Senior Residency and are willing to serve as SR, shall be allowed to appear in the interview. A separate merit list will be prepared .for fresh candidates and for those candidates who have already completed 3 years of Senior Residency. Reservation to Physically handicapped candidates will be allowed as per Rules. Age Limit:: 33 years for Sr. 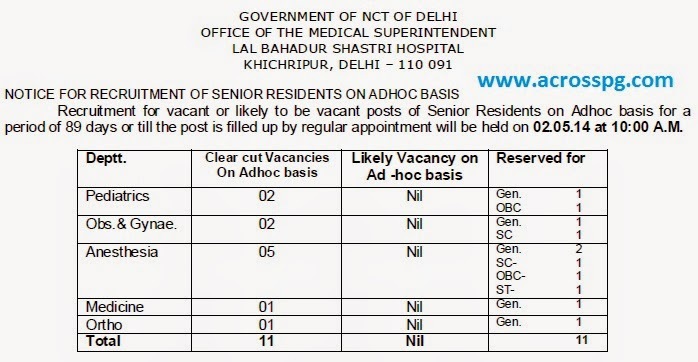 Residents as on 30.04.14 as per Residency Scheme of Ministry of Health & family welfare However, relaxation in the upper age limit will be allowed upto 40 years in case of nonavailability of candidates. PB -3 ( Rs. 15600-39100) p.m. + Rs. 6600(GP) + other allowances as applicable under the Residency scheme.